New Delhi, 21 July 2017: DARE/ICAR has developed 596 high yielding climate resilient crop varieties/ hybrids of field crops for cultivation in different agro-ecologies of the country during past 3 years. During 2016-17 alone record 313 field crop varieties, 51 horticultural crop varieties, 51 new farm implements, 3 vaccines, 15 diagnostic kits and breeding technology for two new fish species developed. Nutrient rich (zinc, iron, protein) varieties viz., DRR Dhan 45 (18.18 ppm Zinc) and CRR Dhan 310 (10.3% protein) of rice; WB-2 (42 PPM Zinc and 40 PPM Fe) and HPBW-01 (40.6 PPM Zinc and 40.6 Fe) of wheat, Pusa Mustard 30 (zero erucic acid) and Pusa Mustard 31 (Double zero) of Indian mustard have been developed. Rice variety IR-64 Drt-1 (DRR Dhan 42) resistant to drought and Samba Sub-1 tolerant to submergence has been developed. IPM 205-7 (Virat), an extra-early (52-55 days) maturing summer mungbean variety, first-of-its-kind globally, developed. Being short duration variety, it will help in increasing the cropping intensity and diversify the rice-wheat cropping system. Pusa Basmati 1609, Pusa Basmati 1509, Pusa Basmati 1637 and Pusa Basmati 1728 have been developed by using new biotechnological tools. Developed 51 new equipment/technologies/products and processes; 219 new prototypes for farm machinery/new farm implements; established 51 agro processing centres; and supplied 16500 units of multiplied prototypes, in the frontier areas of agricultural engineering with great potential to increase productivity, reduce cost of cultivation, reduce drudgery, improve value addition, conserve resources, provide alternate means for energy generation. Demonstrated production potential of new technologies of pulses, oilseed and other crops through 3.21 lakh frontline demonstrations in farmers’ field. Skill development of 40.9 lakh farmers and rural youth. Produced and provided 8.79 lakh quintal seed, 12.52 crore planting material and 9.09 crore livestock strains and fingerlings to farmers. Provided agro mobile advisory to 3.95 crore farmers for improved decision-making. Established 150 pulses seed hubs to produce quality seeds of important pulse crops and production of additional quantity of breeder seed of different pulses was undertaken to attain self-sufficiency in pulses. Established 38 on-station Integrated Farming System (IFS) models and refined 63 existing IFS in 14 agro-climatic regions. All these efforts complement the Government’s efforts to double the farmers’ income by 2022. DARE/ ICAR has set targets, both for short and long term for complementing the efforts of the Govt. by providing technology back up for achieving the goal of doubling farmer’s income. Targets for next 2 years include, evaluation of 20000 germplasm and breeding lines and conservation of 4000 Germplasm for long term storage, conservation of 200 microbial genetic resources, to identify 30 genotypes and register for unique traits, clone and characterize 10 genes, testing 2000 entries in AICRP multi-location trials, identification of 40 varieties including pulses and oilseeds by AICRP varietal identification committees, production of 56000 quintal Breeder seed, developing and testing 25 new technologies, conducting 10000 front line demonstrations and organizing 220 farmers’ trainings. In horticulture sciences targets for next 2 years include, collection of 400 germplasms and characterization of 500 germplasms, development of 100 pre-breeding lines, Identification of 60 promising/elite breeding lines, release of 30 varieties/hybrids, standardization of 50 production technologies, organization of 155 frontline demonstrations, developing 167 modules for capacity building of farmers and other stakeholders, production of 2261 kg breeders/truthfully levelled seed, production of 2250 tonne breeders seed of tuber crops and production of 12.5 lakh quality planting materials and 5 lakh rooted cuttings. Targets have also been set for soil inventory and characterization (1:10,000 scale), designing and developing of organic farming package of practices, designing, developing and demonstration of climate resilient technologies, designing and developing technologies for managing soil health and designing, developing and testing of 3 technologies for Irrigation water Management. Separate targets have been set for animal sciences, fisheries sciences, agricultural engineering, agricultural education and agricultural extension also. All these targeted activities are likely to increase the production and productivity of agricultural crops and other enterprises, add value to the produce, reduce cost of production and increase profit margins for the farmers. This information was given by the Minister of State for Agriculture & Farmers Welfare, Shri Sudarshan Bhagat, in reply to a question in Lok Sabha today. DARE/ ICAR has set targets, both for short and long term for complementing the efforts of the Govt. by providing technology back up for achieving the goal of doubling farmer’s income. 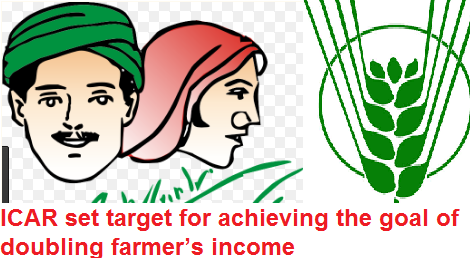 All these targeted activities are likely to increase the production and productivity of agricultural crops and other enterprises, add value to the produce, reduce cost of production and increase profit margins for the farmers.